Done with my night shift week now so I hope to get some building done to morrow. Theory is only the base of practise, a guidence. Imbert calculations offer great starting point and are a cure to many headackes, but can still be altered to need. "It seems anything will work in a gasifier, except tight measurments and tolerances"
Anyways, you will be fine with your plan. Tom I am new to gasification and Im glad for all the help I can get, I have learned over time that its in the details one should turn to the seniors.Its always that one thing you have never experienced youre self that is going to help you. I hope this doesn´t mean you decided stop posting. I wouldn´t like that. You´re one of my favorite posters. You have a very unique ability to dress your thoughts in words and your posts are always fun to read. but for now I have to be more aware of what has been posted in a thread, before I jump in. That sounds like me Tom, I read a post. By the time I get done writing it, and correcting what I have written, It has been answered already and with a better reply then mine. Oh well at least I trying to help. I agree very much with JO. This design has three pyrolizers and two gen-sets so you can repair one while other is in operation . Hi Henry, they have a lot of the same ideas that I have, I how ever am going to dry my biomass on the roof with a double floor system from the waste heat made inside the container. Here is a picture of my feed screw. As of now I have two B20 volvo engines to be used in the container, I plan on two more in storage since these engines are so cheap to buy and easy to repair. Im going to start with one gasifier in the beginning since its not set in stone the best design for continuously gasification. 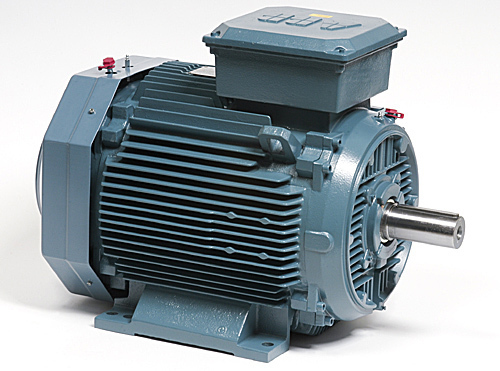 Most of the motors around here are 1450 rpm or 2200 rpm, some times you can find 1850 rpm motors but to find with the right voltage and all belt drive would make it more versatile for my use, also safety vise you would just burn up a belt rather than a coupling. I do not have a working system . I do have one building for making and storing wood chips . I use a space on the floor of a separate barn to sift and size wood chips . I have a large area of concrete slab part of which I painted black that I use to dry wood chips . The generator pryrolizer and wood boiler are in a tractor shed . the inverter and batteries are in the meat locker . Having everything in one space and automated will eventually lead to devastating fire . I think automated feed systems will eventually lead to devastating fire . this has occurred I do not have good reference . usually it happens at places where people are working but not living . Hehe joke aside, Im running a steel container standalone from my buildings, if it burns down all I lose is whats inside. The reason for this compact setup is to get it as efficient as I can, easy to swap out motors and so on, I can use raw wood chips with no pre drying, in the long run I would still do a compact setup in a fireproof room inside the barn, the wood chips would be outside and screw feed inside. Has anyone built a header heat exchanger here on the forum? That may however cause trouble. Gasifiers don’t like moisture. “Dry” fuel contains enough moisture as is. A condensing hopper where the chips are allowed to stay long enough to dry out will be required. I’d suggest you plan on using as much heat as possible from the outgoing gas and engine exhaust in the drying process. It will ad a great deal of complexity to the build, but that’s ok since you’re stationary. Yes that is the plan Jan-Ola, I hope that logs that has been stacked over the winter is going to dry enough. The drying process after the half dry wood chips is loaded on the roof is as following: the roof has a double perforated floor for induced air to dry the wood before the feed screw, in the loading pipe and the hopper Ill use the wood gas to pre dry. I have been studying the Viking gasifier and Im going to use ideas from that plant. 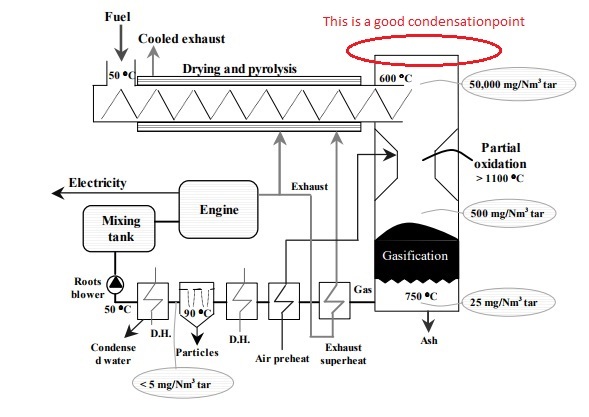 Drying and even pyrolysing, but nowhere is that extra moisture taken out before the real gasification…? Why? Steaming through is an extra burden for the process. It will carry heat through the hearth to no wail. Just for recycling? Hi Max, hopefully the predrying of the wood chips will make the humidity of the chips under 30% before entering the feeding screw, after that my plan is to condensate some of the rest of the humidity at the top of the hopper on a cooled surface and out to drain tank.